A new traditional style Georgian country house sitting in 17.6 acres of gardens and agricultural land in an elevated position lane with extensive views over the rolling Hampshire countryside and within easy reach of the M3 a major artery to both London (65 miles) and the South West. 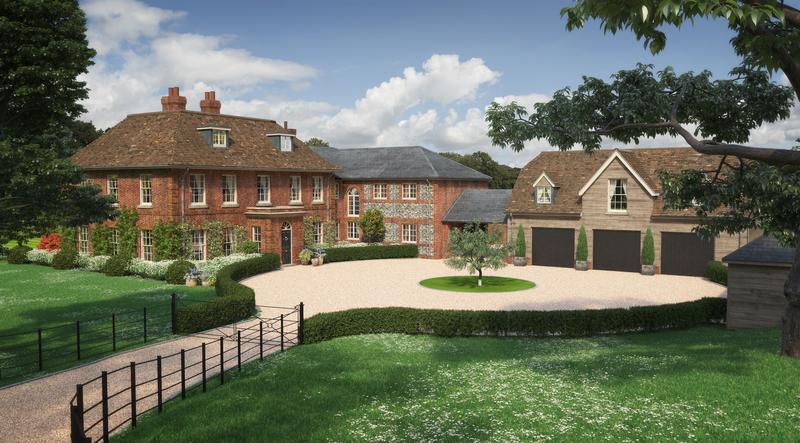 Fairfield House will be a classically styled country house situated on the edge of the Grange Estate, renowned for the popular Grange Park Opera during the summer months, and on the outskirts of the village of Itchen Abbas. It is approached from a quiet rural lane that runs to the north of the village. This new house is arranged over ground and two upper floors and totals about 6660 Sq ft with a detached three bay garage block with flat above of about 725 Sq ft, a machinery store and tennis court. Winchester is around 5 miles (16 mins by car), Micheldever 8 miles (about 16 mins by car) and Shawford 9 miles (about 18 mins by car). Both Winchester, Micheldever and Shawford have regular train services into London Waterloo (1hr 9min, 57 mins and 1 hr 18 mins respectively).